Tracy recently acquired a beautiful pair of flora print rain boots. She has really been getting a lot of use out of them due to the inclement weather we have been having. Now, that it is not snowing we are constantly having rain or thunderstorms. I have been thinking that I either need to "borrow" Tracy's rain boots when she is not looking or look for a pair for myself. I love that Tracy's are a floral print and find it so hard to decide what I want my rain boots to look like. Do I want a fun print, a bold solid, or a neutral pair of rain boots? It's hard to decide. I have really been trying to save money this year. Putting more money into my savings account was one of my goals for this year, so I really want to get a beautiful pair of rain boots without hurting my wallet. Below are my favorite finds for under $50. I am also in love with the color of these Coach rain boots and they are currently 45% off! These options are certainly affordable enough that you could treat yourself and still save. The short pair with the bow is so cute! LOVE the mint colored ones! They totally look like Hunters for less than half the price! In the past 2 years I've become a Target person. I seriously had barely been there in the past. It's awesome! I buy almost all my clothing there now (maternity stuff). These are all so pretty - too bad it never rains in Los Angeles! Some weeks ago I bought a pair of rain boots by Moshino, at first I believed to have did a wrong choise but every time that's rain I thank for them! Love your selection! In love with that first green/teal pair with the buckles. Too cute. i seriously need a pair! 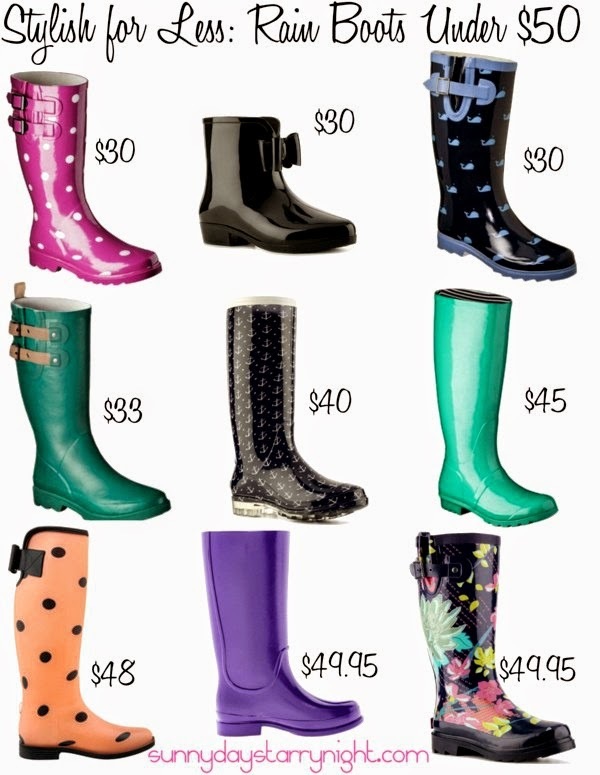 i love how rainboots are more fun & stylish nowadays. The ankle boots are adorable! I'd probably pick them and end up still getting my feet soaked since they don't come up very high!